Knowledge on the responses of endangered species to current global changes can highlight the necessity and importance of protecting these species. Tree-ring-based studies provide a longer term perspective than monitoring studies on the responses and adaptations of the growth of endangered species to climate change and forest disturbances. Therefore, this study conducted a tree-ring case study on Keteleeria fortunei, an endangered and endemic species in southern China, and presents the first tree-ring chronology of K. fortunei from 1850 to 2013 in the Fuzhou area, which is located west of the Taiwan Strait. 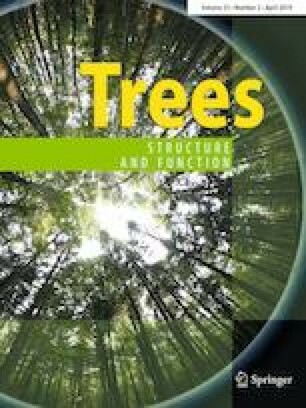 K. fortunei trees tend to grow in moister locations in closed forests and are more sensitive to forest disturbances and sunshine than Pinus massoniana. Our study shows that missing rings are more frequent for K. fortunei than for P. massoniana in the same area, which agrees with previous findings that wedging and missing rings tend to occur in trees experiencing growth suppression in closed forests. The online version of this article ( https://doi.org/10.1007/s00468-019-01839-0) contains supplementary material, which is available to authorized users. We are highly appreciative for the constructive comments from two anonymous reviewers. This research was funded by the Strategic Priority Research Program of Chinese Academy of Sciences (XDB26020000), National Science Foundation of China (41822101), fellowship for the National Youth Talent Support Program of China (Ten Thousand People Plan), Swedish Research Council Formas project (Future Research Leaders), Fellowship for the Youth Talent Support Program of Fujian Province, nonprofit project of Fujian province (2015R1101029-8) and innovation team project (IRTL1705).